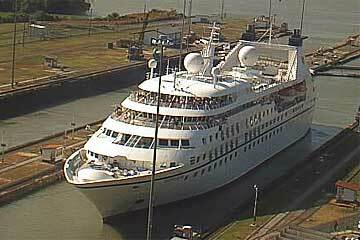 Seabourn Legend is a Seabourn Cruise Line cruise ship, constructed by Schichau-Seebeckwerft in Bremerhaven, Germany and put into service for Kloster Cruise in February 1992. 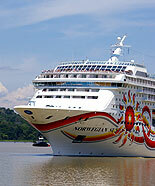 The ship was originally named Royal Viking Queen, and operated on various crossings for Royal Viking Line, a Kloster subsidiary. 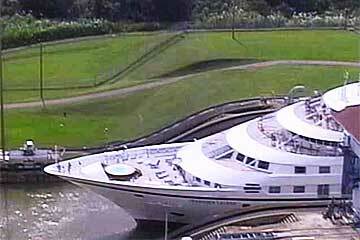 The Seabourn Legend was featured in the 1997 film Speed 2: Cruise Control. In the movie, Annie Porter (Sandra Bullock) is trapped on the ship, where navigation computers has been reprogrammed by a computer hacker, (Willem DaFoe) setting the ship on a collision course with a supertanker. 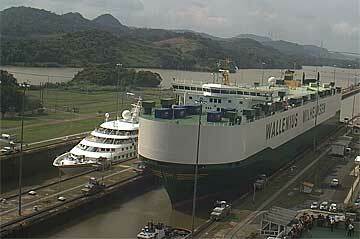 In the attached images you can see the MV Seabourn Legend in the Panama Canal southbound on the 2nd of December 2009.
on her South Bound Transit on January 13th 2010. It is the identical sister ship of the Seabourn Spirit and Seabourn Pride, all designed by Petter Yran and Bjørn Storbraaten.